I do not have such an extensive knowledge of Dornenreich’s back catalogue as to offer precise statements on where this album stands along the band’s musical evolution. 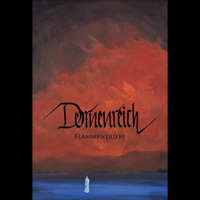 What I can say is that it’s impressive how much the band does not seem to have run short of inspiration despite “Flammentriebe” (“Sprouts Of Fire”) being Dornenreich’s 7th album in 14 years. The music in “Flammentriebe” clearly does expose the band’s Black Metal roots but the music is also highly atmospheric and delves deep on an emotional level. It’s an album that could very likely appeal to fans from beyond Black Metal circles. Dornenreich use German in their lyrics (the band is from Austria) - this is a language with which I am only superficially familiar. Despite this, I found no difficulty in being lured into the music. Take ‘Tief Im Land’ (‘Deep Inland’) for instance – the way the band uses keyboards, acoustic guitars and violin along with typical Black Metal guitar chords might sound deceptively simple. Repeated listens, however, will have you noticing new things every time. And that’s not something I can say for many bands of this genre of Metal. You probably have to be in the right mood to appreciate “Flammentriebe” but when that does happen it’ll leave a lasting and fulfilling impression on you.